Publication History: This article is based on "Crain's Analyzing Unconventional Reservoirs" by E. R. (Ross) Crain, P.Eng., first published in 2006, and updated annually until 2016. Updated Mar 2019. Updated Mar 2019. This webpage version is the copyrighted intellectual property of the author. Most of us are familiar with traditional tight gas reservoirs – clean, low porosity sandstones or siltstones that look unattractive on log analysis, at least by the conventional wisdom of the 1960’s. Porosity averages from 5 to 10% with permeability between 0.01 and 5 mD. The best know play of this type is the Alberta Deep Basin, developed in the 1970's and 1980's, and still an area of interest today. This particular tight gas play is called a basin-centered gas accumulation - the trapping mechanism is not structural or stratigraphic, but a "water block" above the gas caused by low relative permeability. There is considerable exploration and development effort being expended on such plays today, especially in the USA, Europe, and the Middle East. With the steady improvement in massive fracturing jobs, pioneered in the Deep Basin, and in horizontal well placement, even tighter, lower porosity gas zones are now economically feasible. These have porosities that may average 3 to 6% and permeabilities from below a microDarcy to a few milliDarcies. The Doig and Montney in Alberta and northeast BC are examples. Both are radioactive due to uranium and have often been called shales, even though the average grain size is above 4 microns and there is little clay mineral or clay sized particles. The organic content is fairly low (1 to 3% TOC) so there is little adsorbed gas. They do not qualify as "shale gas" until 67% of the particles are less than 4 microns. Some tight gas plays have a significant liquids component. Such wells are highly desirable due to the price differential between gas and oil. Unfortunately, log analysis cannot partition gas from oil at these low porosities so tight rock core analysis and petrographic analysis are important tools. Mineralogy and clay content are highly variable so XRD analysis is also vital. Alberta Deep Basin strat chart, showing gas producing reservoirs, circa 1981. Note that Montney was not among the productive category at that time. The petrophysical model uses conventional log measurements with conventional shale corrected density neutron complex lithology porosity model to handle quartz plus heavy minerals. 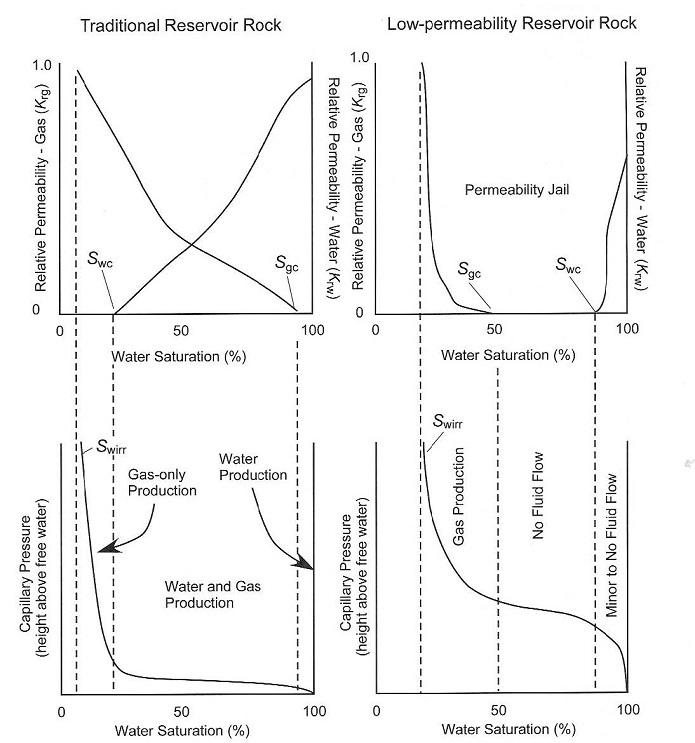 A shale corrected water saturation equation, such as the Simandoux or Dual Water models are used. Most zones in a tight gas environment produce little water except at the updip edge, so RW is actually derived from pre-determined water saturation values found by capillary pressure measurements. A table of RW values and a stratigraphic chart for the Deep Basin play were published in "Log Evaluation Results in the Deep Basin Area of Alberta", by E. R. Crain, Transactions: 8th Formation Evaluation Symposium, CWLS, Calgary, September 1981. Saturation exponents are often default values (A = 1.0, M = N = 2.0) because not very many electrical properties measurements have been reported. Lower values of M = N = 1.7 or 1.8 may be needed to force calculated water saturation to match core analysis or capillary pressure minimum water saturation. “Tight Gas” example showing core porosity (black dots), core oil saturation (red dots). core water saturation (blue dots), and permeability (red dots). Note excellent agreement between log analysis and core data. Separation between red dots and blue water saturation curve indicates significant moveable gas. The core analysis shows considerable residual oil - some of this may be moveable, in addition to any condensate carried in the gas. 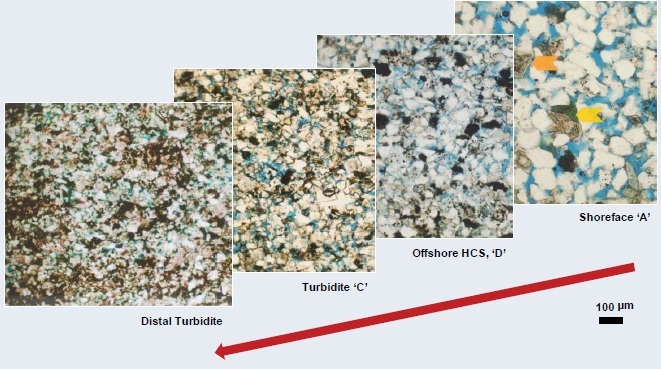 This is a relatively high grade example with porosity between 5 and 6% and permeability between 0.1 and 0.8 mD. Grid lines are 1 meter spacing. NOTE the high uranium content (left hand curve in Track 1) is in the middle of the best pay. core porosity using the total gamma ray as a shale indicator. RUN THE SPECTRAL GAMMA RAY LOG TO ELIMINATE THIS PROBLEM. The geology of most tight gas plays, whether old fashioned like the Alberta Deep Basin, or the new "really-tight" plays is slightly more complicated than conventional gas plays, although the two can combine or grade into each other. One of the better descriptions is in "Tight Gas Reservoirs – An Unconventional Natural Energy Source for the Future", by G. C.Naik, SPE 2003. Naik describes four criteria that define basin-centered gas accumulations like the Alberta Deep Basin, including low permeability, abnormal pressure, gas saturated reservoirs and no down dip water leg. Later he mentions the updip water block that traps the gas, as proposed by Masters and Gray in the late 1970's.But not all tight gas is a basin-centered accumulation, so different concepts apply in different areas. 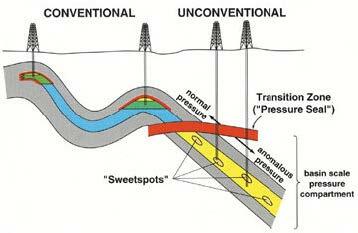 The illustration at the right attempts to show the difference between conventional and unconventional basin centered gas accumulations. The red interval acts as an updip water block, with gas below it in unconventional traps, with conventional traps above the seal. Master and Gray wrote that the water block is transitional over a 5 to 10 mile wide band and is not related to a structural or stratigraphic boundary. 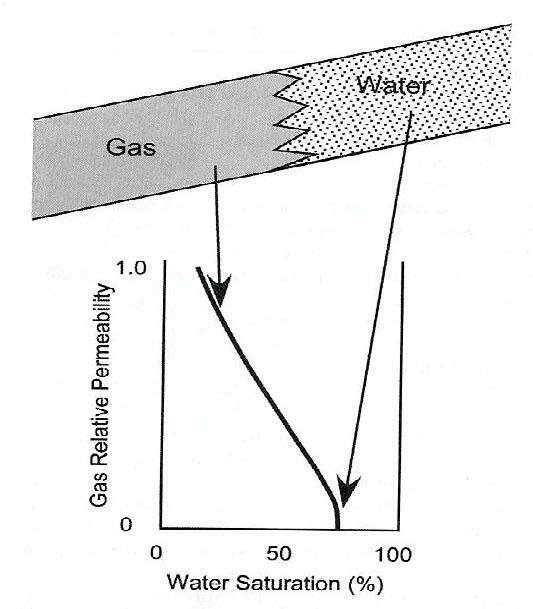 Masters and Gray explained this phenomenon by showing where the water block and gas reservoirs fit on the relative permeability curve for the gas - water system, as shown on the left. Little water is produced in the gas zones, regardless of water saturation, due to the low relative permeability of the water phase. The concept of a water block merely means that irreducible water saturation is very high. On log analysis depth plots, this looks like "water over gas", which cannot happen in a conventional reservoir. The result looks like an upside-down transition zone. Basin margin gas traps, as in the Cretaceous of south eastern Alberta, are relatively low porosity, low permeability plays, but are not now considered to be unconventional. They do not have a water block as a seal and occur in normal stratigraphic traps. The gas is biogenic (formed from kerogen in situ). Gas does not migrate far from its source. Their behaviour is sometimes a little unusual, depending again on the relative permeability curves. According to Naik's paper "In a traditional reservoir, there is relative permeability in excess of 2% to one or both fluid phases across a wide range of water saturation. Further, in traditional reservoir, critical water saturation and irreducible water saturation occur at similar values of water saturation. Under these conditions, the absence of widespread water production commonly implies that a reservoir system is at, or near, irreducible water saturation. In low-permeability reservoirs, however, irreducible water saturation and critical water saturation can be dramatically different. In traditional reservoir, there is a wide range of water saturations at which both water and gas can flow. In low-permeability reservoirs, there is a broad range of water saturations in which neither gas nor water can flow. In some very low-permeability reservoir, there is virtually no mobile water phase even at very high water saturations." Comparison of capillary pressure and relative permeability curves for conventional gas (left) and tight gas (right) showing a large water saturation range in tight gas reservoirs over which no gas or water will flow. The Montney distal shelf (‘tight gas’) play has become one of the hottest natural gas resource plays in the WCSB. Horizontal drilling and multi-stage frac technology have been the key to unlocking the resources and placing the Montney in the top three most economic resource plays in North America. Industry analysts estimate upward of 5,000 horizontal wells will be drilled in the upcoming decades, with a capital outlay approaching $30 billion. To illustrate petrophysical analysis of tight gas sands, we will use the Montney as the classic example of the problems and solutions. Some of those problems are radioactivity from uranium associated with kerogen, highly variable mineralogy, very fine grained texture, and several hydrocarbon types that are difficult to segregate. Most tight gas sands have a wide variety of rock textures and mineral compositions vertically in the wellbore as well as laterally between wells or along the track of horizontal wells. Trying to find "sweet spots" and steering along them is a challenging task. The illustration below shows microphotos of four distinct facies in the Montney from west east across west central Alberta. Porosity, grain size, saturation, and permeability vary considerably. Photo micrographs of Montney facies. The stratigraphic cross section is also complicated so correlation across long distances is somewhat difficult. Many tight sands are radioactive due mainly to uranium associated with phosphates or kerogen. This can be identified with a spectral gamma ray log and it should always be run when penetrating radioactive sands. Sadly, it is often not requested, even though the service is cheap and costs no extra rig time. 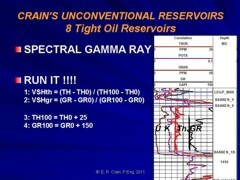 Spectral gamma ray log shows Uranium (U), Potassium (K), Thorium (Th), and standard gamma ray (GR). Red vertical line is TH0, the clean line for the Thorium curve, and the black vertical line is GR0, the clean line for the GR curve. The Thorium curve is best for shale volume calculations. The SP is flat and useless, Density neutron separation is mostly due to dolomite and other heavy minerals so it cannot be used. The gamma ray can be used in the absence of the Thorium curve by assuming Uranium content is constant. Calculation of porosity is very sensitive to the shale volume in tight gas sands, so it is critical to calibrate Vsh from logs with clay volume from bulk XRD data sets or tables of petrographic thin section point counts. A difference of a few percent clay can mean the difference between NO PAY and ALL PAY. A more complete description of the porosity method and the conversion of TOC weight fraction to kerogen volume fracture are given in the Gas Shale Chapter. This step requires careful calibration. For example, if Vker > PHIek, there is something seriously wrong in the calculation of PHIek or TOC. Methods that avoid the neutron log are also useful, including sonic-only, density-only, or sonic density crossplot. Each method should be shale corrected and calibrated to core. Matrix and fluid properties are needed for this, possibly on a zone by zone basis. Some samples are shown below. DTCfluid = 500 usec/m and DENSmatrix = 2710 with DENSfluid = 1050 kg/m3. The red line on the density crossplot shows a relationship with DENSfluid = 400 kg/m3. Such a relationship has received some support in the industry but clearly does not fit the core data available on this project. The matrix values that lead to PHID and PHIS may need some juggling to calibrate to core porosity. Values in the quartz + heavy mineral range usually work. An example is shown later on this page. More sophisticated multi-mineral and statistical methods are definitely desirable, but these are not always available quickly. If these methods agree with each other, then the regression worked well. If they are in general agreement with the density neutron crossplot, then it should be used because it has slightly better compensation for mineral variations. However, if it is considerably higher than sonic and density results (or core data), then abnormal neutron absorber minerals should be suspected and the density neutron method should be discarded. To reduce rough hole and sonic skips, taking an average of 3 or 4 methods may be used. Nuclear magnetic resonance logs have become popular in tight gas, but they require special attention. They generally show near zero effective porosity (BVI + BVM) but the NMR total porosity (CBW + BVI + BVM) is close to the effective porosity from the methods discussed above. This suggests that the NMR cannot tell the difference between clay bound water, capillary bound water, or gas in these low porosities. In many cases, the electrical properties must be varied from world average values to get Sw to match lab data. Typically A = 1.0 with M = N = 1.5 to 1.8. The result is very sensitive to clay volume (Vsh) and shale resistivity (RSH) in low porosity rocks. Electrical properties variations between facies and with depth or diagenesis are not published. This lab work is worth the effort, as considerable increases in gas in place are possible with small reductions in M and N values. Water recoveries are usually negligible and fairly fresh as the water is condensed from entrained water vapour. The minimum water saturation on capillary pressure curves might be used to work backwards to find an RW that will give a reasonable water saturation. Core analysis water saturation, at least in more modern wells, seems to be a good guide and RW can be adjusted accordingly. 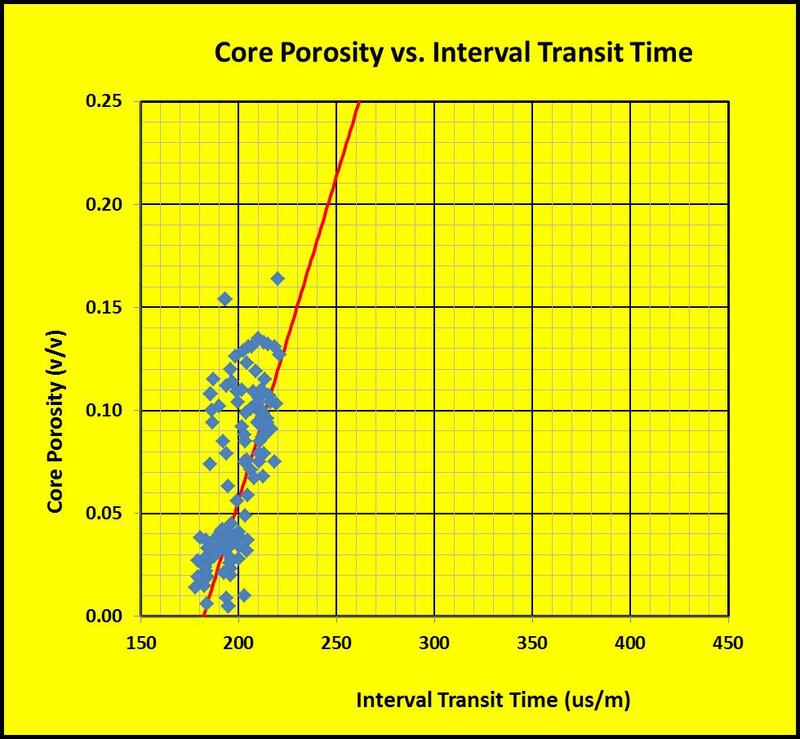 Permeability may show a reasonable relationship to core porosity. In the example at right, there is a strong correlation. Many older core analyses do not record permeability below 0.01 mD so are quite useless. Modern tight rock methods can give permeability in nanoDarcies. The equation of the line in this example is Perm = 10^(20.0 * PHIe - 2.75). A few high perm data points are fractured samples. 22: DENSma = (DENS - PHIe * DENSfluid - (1 - Vsh) * DENSSH) / (1 - PHIe - Vsh). If Vsh > 0.85, we set DENSma = DENS. 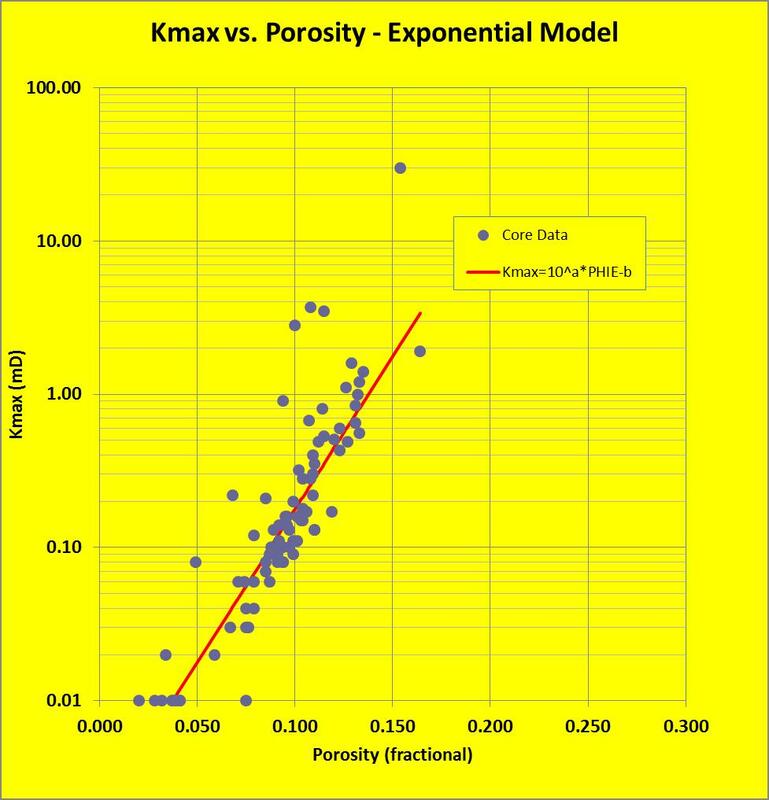 If matrix density is too high compared to known lithology, it means porosity is too high. Adding shale or eliminating bad data will reduce this problem - the calculation is a good quality-control step. Multi-mineral solvers can be used if spectral gamma ray data is available. In this case, shale volume would be derived also. Elemental capture spectroscopy logs are also used. These solve for the minerals and kerogen from the chemical element composition of the rock discovered by the logging tool, but it may not do justice to the porosity, which should be checked by conventional methods. As in all things petrophysical, there is not much accuracy in the calculation of small volumes of minerals or porosity. Dispersed pyrite is described in most XRD reports on at least the Doig and Montney, but not in the Cretaceous Deep Basin reservoirs. 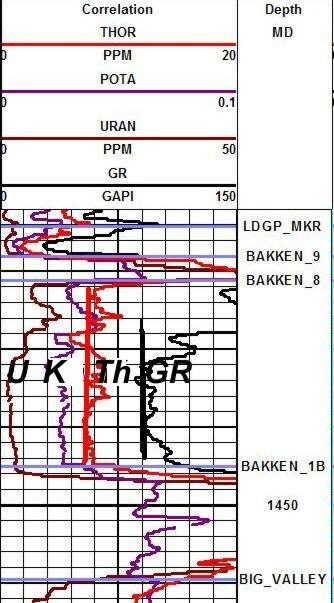 However, unlike the Bakken tight oil case, it seems to be unconnected to the porosity and has no impact on the high resistivity values seen in these zones. So far, no corrections have been needed in the tight case plays. 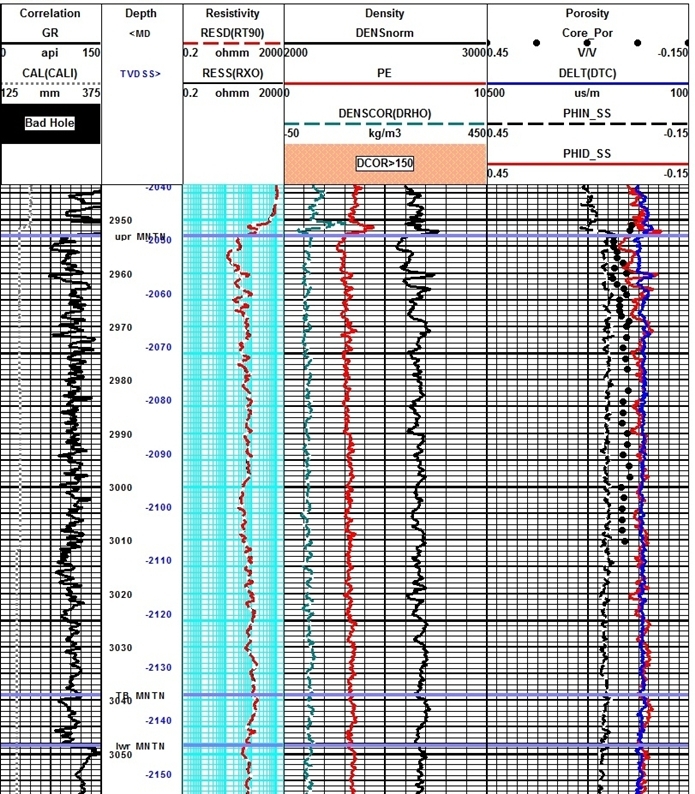 This example shows a tight gas sand in the Montney play that behaves like a normal sandstone as far as log analysis is concerned. The porosity is halfway between the density and neutron porosity curves. The gamma ray is quite high due to uranium, but the XRD bulk clay is low (0.00 to 0.10 fractional, 0 to 10% by weight). These values don’t change much when converted to volume fraction. Resistivity is reasonably high and RW is moderately low, so water saturation is low. Only the raw log curves are shown here to illustrate the fact that visual analysis is quite straight forward provided you get over the “hang-up” of the high gamma ray values. Example showing raw logs for a typical Montney tight gas sand. Zone is clean and core porosity is halfway between the density and neutron porosity. Zone is radioactive, quartz + dolomite. This next example shows the effect of abnormal neutron absorbers on the porosity results, and the use of sonic and density data to avoid giving too high a porosity. Some wells show larger neutron offsets; some show no abnormal effects. Calibrating each curve to core and then taking an average tends to remove variations in lithology that would otherwise distort the porosity result. This illustration of a portion of a lower Montney shows the use of multiple pay flags (porosity of 3% = red, 4% = green) beside GR track that emphasize the laminated nature of the porosity. The "multi-porosity" track to the right of the resistive has (from left to right) PHIN_SS, PE, PHIxndc (grey), PHIS (blue), Final Porosity (solid black), PHIDcustom (green), and PHID_SS.The final porosity is a weighted average of the other curves, after shale corrections, because there appear to be abnormal neutron absorbers that have shifted the neutron to the left, causing the density neutron complex lithology model to read a bit too high. 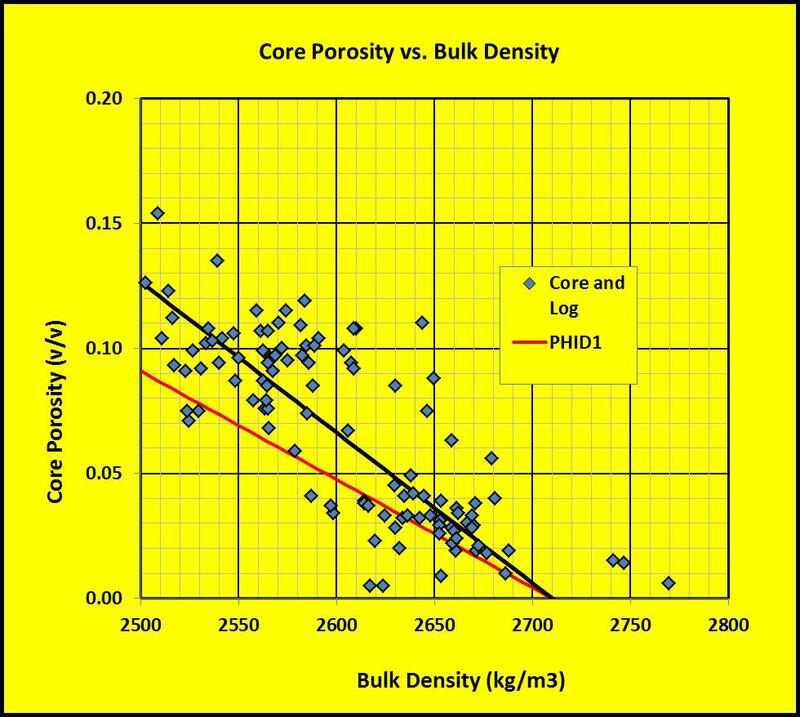 The matrix density track shows reasonable values that agree with XRD and core grain densities in other wells. The porosity track shows the final porosity (shaded red) with crossplot porosity just a little bit to the left. Permeability is from regression of core data. Lithology on the far right is a 2-mineral model using the matrix density derived from porosity and density data, using quartz+feldspar and dolomite+heavy as two "generic" minerals. Grid lines are 1 meter spacing.